This view of NASA's Small Pressurized Rover shows its ability for sideways and rotating 'crab-like' movements. NASA?s newprototype for a future moon truck is proving to be the ultimate lunar RV, allowingastronauts to take extended road trips without the constant drag of bulkyspacesuits. Aterrestrial version of the SmallPressurized Rover, which can go forward, reverse and side-to-side to tackletough terrain, is completing a three-day drive across the Arizona desert today aftera successful week of testing, NASA officials said. ?It?s justan incredibly capable machine,? said Doug Craig, NASA?s strategic analysismanager for the exploration systems at the agency?s headquarters in Washington,D.C. ?It?s going great and everyone?s really pleased with it.? Astronautsand geologists split into two, two-person teams to test the unpressurized andpressurized rover versions on the barren Black Point lava fields of Arizona. The roveris part of NASA?s bid to return astronauts to the moon by 2020 under the Constellationprogram. While some engineers are developing program?s Orion spacecraft,Ares I and V rockets, and Altair landers, others are testing how best to moveastronauts on the moon once they get there. Humansfirst drove vehicles on the moon in 1971, when Apollo 15 astronauts Dave Scottand Jim Irwin unfolded their electricLunar Roving Vehicle from its berth on their Falcon lander. Two other mooncars followed on NASA?s last two Apollo flights, but those rovers were builtfor limited trips. ?Thoselunar rovers were disposable, so they were only going to be used for two orthree days,? Craig told SPACE.com. ?These that we?re looking now, we?relooking at up to five years length on the moon.? The newmoon trucks are designed to serve as either a cargo carrier or lunar buggy. Thepressurized module version sports a pair of rear-mounted spacesuits withconnecting backpacks. Astronauts would step into suits, shut the backpack hatchand then detach themselves for lunar exploration. The recent tests found roverdrivers could suit up relatively easily, Craig said. ?We endedup having to build in hold times because they could get in and out so fast,? headded. Under NASA?scurrent plan, two rover teams would take their moon trucks out on journeys thatcould last up to two weeks away from a lunar base. If one rover breaks down,all four astronauts could pile into the remaining vehicle and head home. The newmoon truck actually suffered a flat tire on Monday, with its drivers suiting upand successfully swapping out the flat with a new one, Craig added. The longestever lunar rover trip during the Apollo era covered just under 8 miles (12.5km), according to NASA records. ?We?retalking about hundreds of kilometers,? Craig added. ?This is a completelydifferent paradigm than Apollo.? NASA?s newmoon rover consists of two separate parts: the RV-like pressurized cabin andthe 12-wheeled Chariot base that can be driven independently by aspacesuit-clad astronaut while perched atop a rotating control turret. ?One of thesurprises was how much better the Small Pressurized Rover was than theunpressurized rover,? said Craig, adding that the teams found driving from theunpressurized turret tough going. ?When you?re in a suit for eight hours andbeing bounced around, it really beat them up. At the end of the day, they werereally fatigued.? But evenafter 10 hours of driving from inside the pressurized version, the test crewswere still primed for more mock moon roving action, he added. 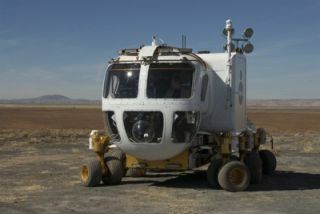 NASA?sChariot moon truck chassis consists of six bug-like legs, each of which tippedwith two wheels. The 2,204-pound (1,000-kg) vehicle is about 15 feet(4.5 meters) long capable of hauling twice its weight in cargo and driving upto 6 mph (10 kph) on rough terrain. Each of the wheel talks can pivot 360degrees and be lifted up to clear rocks or other obstacles, giving the Chariotthe ability to mimic a crab?s flexible mobility, Craig said. Thepressurized cabin adds an extra 4,409 pounds (2,000 kg) of weight to the rover,but comes with extra amenities like living quarters, cabinets for provisionsand tools, and a shielded section for shelter against radiation events. ?Theyprovide a safe haven for astronauts on the lunar surface in case there?s asolar flare,? Craig said. ?In Apollo, they didn?t have that safe haven, andthey?d have to go back to the lander.? In additionto the step-in spacesuits, the rovers have a large side hatch designed toattach directly to a moon base entrance. ?These arestill concepts, ?Craig said, adding that new modifications will likely follow theBlack Point tests. ?It?s been a really good test out there. We?re learning alot.? NASA spentabout $38 million to develop its Apollo lunar rovers in the 1960s and 1970s,according to agency records. But the final cost for the new moon buggies remainto be seen. ?The lineis ?more than a Ferrari,?? said Craig, adding that the current concept is amix-match of parts and improvements, must still be refined into a final design. ?It?s kind of hard to put a number on it. ?